South Florida is bracing for a major storm surge and powerful winds even as Hurricane Irma weakened to a Category 4 storm as it races toward the U.S. mainland. "Obviously Hurricane Irma continues to be a threat that is going to devastate the United States," Brock Long, administrator of the Federal Emergency Management Agency Administrator (FEMA), said at a press conference Friday morning. "We're going to have a couple rough days." Irma was downgraded from a Category 5 to a Category 4 storm early Friday morning. 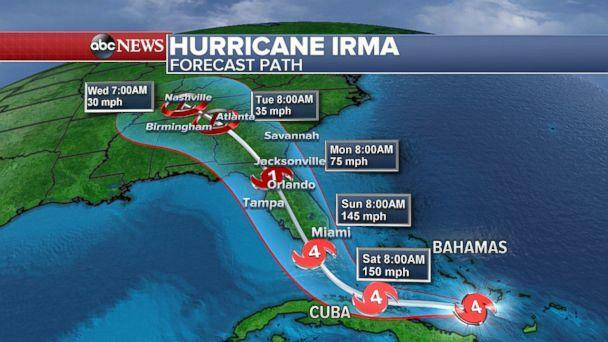 As of 11 a.m. Eastern Time, the storm was moving 14 mph and located 405 miles southeast of Miami. The National Weather Service cautioned that Irma is still "extremely dangerous," with maximum sustained winds of 150 mph, which are strong enough to uproot trees, bring down power poles and rip off the roofs and some exterior walls of well-built frame homes. 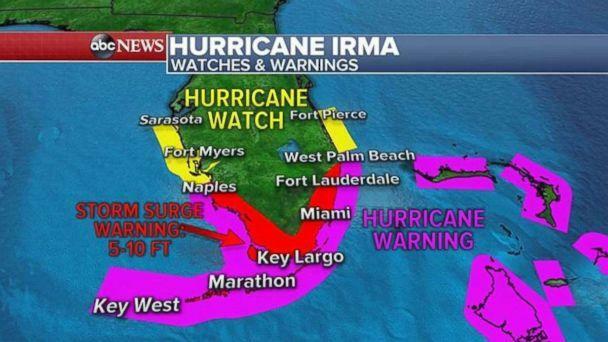 The National Weather Service issued its first hurricane warnings for Florida overnight, warning residents that "preparations to protect life should be rushed to completion." Mandatory evacuation orders have been issued for barrier islands, coastal communities, low-lying areas and mobile homes across Florida, including the counties of Brevard, Broward, Collier, Indian River, Martin, Miami-Dade, Monroe, Palm Beach and St. John. ABC News estimates roughly 1.2 million Florida residents have been ordered to evacuate. Meteorologists expect Irma will approach the Florida Keys and southern Florida late Saturday night and then make landfall near Miami as a strong Category 4 hurricane with winds near 140 to 145 mph sometime between 7 a.m. and 9 a.m. Eastern Time on Sunday. Overnight projections of Irma's path showed less of a threat to the Carolinas as the monster storm appears likely to move directly up the middle of Florida and curve inland. Meteorologists predict Irma will continue to weaken as the storm moves inland Sunday into Monday. Irma will approach Orlando on Monday around 8 a.m. Eastern Time with winds of about 75 mph, which would make it a dangerous Category 1 hurricane. After moving over Orlando, Irma should weaken rapidly to a tropical storm later Monday as it moves across state lines into Georgia, then potentially Alabama and Tennessee, meteorologists say. A storm-surge warning was in effect Friday morning for the Florida Keys and the Sebastian Inlet southward around the Florida peninsula to Venice, with the National Weather Service saying there is "danger of life-threatening inundation from rising waters moving inland from the coastline, during the next 36 hours." Moreover, heavy rains are forecast to drench northern Florida, Georgia and even possibly South Carolina and Tennessee by Tuesday. 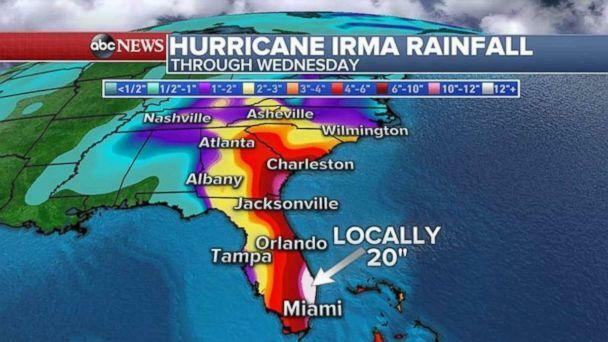 Rainfall accumulations in southeast Florida and the Florida Keys are expected to reach 10 to 15 inches, with totals up to 20 inches locally. Eastern Florida, up the coast to Georgia, is expected to receive 8 to 12 inches, according to the National Weather Service. Government personnel have been deployed from Alabama to North Carolina to prepare for Hurricane Irma. Florida alone should anticipate days-long power outages, FEMA said.